Is the general industry conclusion following a few weeks of panicking, confusion and sensationalist headlines like how ad blocking is the end to big advertising. We seem to have generally settled on the fact that as people now spend 90% of their time in app, then this latest iOS update doesn’t really matter that much and instead we can focus our complaining on all the issues (crashing, bugs etc) that we’re finding with Apple’s latest update. Then there are the intelligent debates around the longer term implications of Apple trying to stop people using the mobile web altogether due to the fact it’s very much controlled by Google through Google’s ad server Double Click for Publishers (DFP) which is Google’s primary revenue stream. However before we can start thinking about the future shape of advertising and publishing, shouldn’t those of us in Asia (and people in Global roles) stop for a minute and think whether the chart above, that is doing the rounds in various guises but ultimately is the same Flurry Analytics and comScore data for the U.S. is representative of people in your country? Asia’s mobile landscape is very different to the U.S. However if you search for ‘mobile ad-blocking Asia’ you will find very little information on the implications of iOS 9 allowing ad-blocking technology for Asian markets. One interesting observation from Opera suggests that only 10% of mobile web impressions are in app in Asia. It’s important to note that this refers to ad impressions, not time spent and is therefore not directly comparable to the chart above. That said, when comparing the impression data to the other regions, it is clear that actually it is the U.S. that is the exception, with only the U.S. (and Oceania) having more app impressions than mobile web impressions. The fact that both time spent and impressions sit’s at around 90% in the U.S. tells us that there is some consistency, so the fact it’s the total opposite in Asia means we really shouldn’t be taking the U.S. data and assuming it’s representative of users here. As you might imagine, there is a lot of diversity in Asia too. For example Japan is a big Apple market (where iOS has 66% share), but Taiwan is 90% Android and the biggest smartphone market in the region, China, is 73% Android (and has a big influence on the total Asia number in the chart). So does that mean at an Asia level at least, we are safe from iOS ad-blocking? So far we’ve found out that on one side, there is a lot more in browser mobile internet usage in Asia (panic) but then we found out that iOS is only 11% of Asia’s operating systems (sigh of relief). So are we all square? As we can see from the chart above, neither Safari nor Chrome has Asia buttoned down. 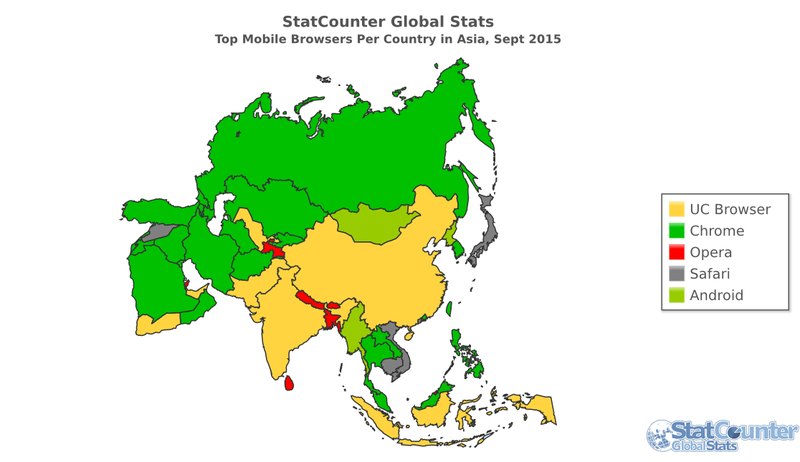 In fact there are 5 browsers that have >10% share of time spent in Asia. Chrome leads the way with 26%, but UC browser is a close second with 23% demonstrating both the diversity and the competition in the region. Crucially UC has a leading position in it’s huge domestic market of China (37%) and is totally smashing it in fast growing emerging markets like India (45%) that have everyday concerns around connection speeds and data usage. The growth has been driven by understanding these challenges and incorporating compression technology that allows for faster load times on slower connection speeds, adding the ability to download files into the browser when on WiFi and watch / view them later and a pretty intuitive ‘card’ system that works better than typical bookmarks. Oh, and the Android version has a built in ad blocker. Therefore you don’t need to be a statistician to work out that iOS 9 allowing ad-blocking has a pretty negligible impact on mobile advertising in Asia. 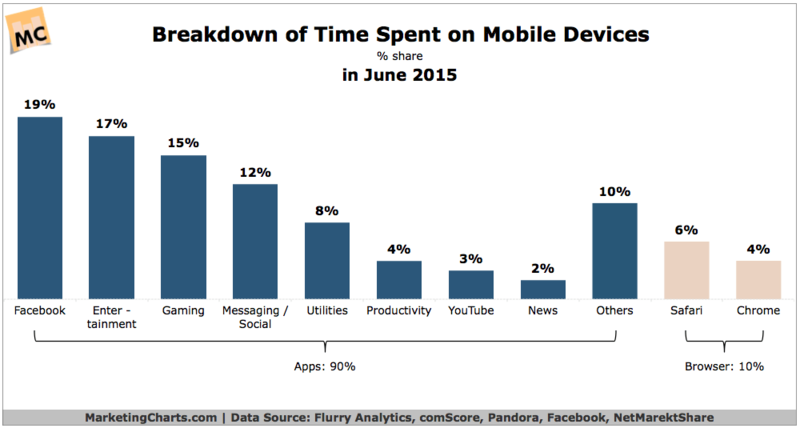 The majority of mobile users have already found ways to limit data usage like using the UC or Opera browser and ad-blocking technology. Whilst I don’t have the data, I’d also hypothesize that the 11% of iOS users in Asia are probably closer to the U.S. in terms of spending more time in app than using a mobile web browser. This is because these users clearly have a high spec smartphone that can store and run a multitude of apps that generally offer a better experience than any browser. For now, Ad viewability is a bigger concern than ad-blocking .In addition to bot fraud, the inconsistency on what constitutes a ‘view’ varies wildly between ad networks, Facebook, YouTube, Snapchat, Twitter, LINE, Flipboard etc. Marketers need to understand the difference. Understand the different interests that subsets of your audience has, create content that taps into these interests but that is consistent with your brand values then distribute at scale using the platforms that best meet marketing objectives.